These lamb recipes include lamb chops, rack of lamb, leg of lamb, lamb kebabs and more. In America, lamb is more popular in the Spring and during Easter. 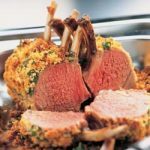 The lamb recipes featured here include nutritional information to make meal planning as easy as possible. Recipe for Adobo-Crusted Lamb Loin Chops from our Main Dishes recipe section.